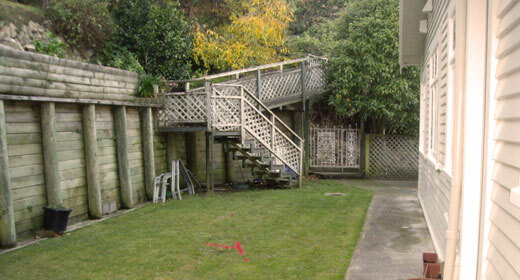 The site was within private property on a steep hillside between Evans Bay Parade and Overtoun Terrace. There were two sections to the contract which were both replaced by open trenching, with a section between them being relined under a separate contract by another contractor. The lower section was accessed from the stairs at number 510 Evans Bay Parade and the upper section was accessed through a private driveway servicing number 93 and 93a Overtoun Terrace. The contract was managed by Capacity Infrastructure Services on behalf of the Wellington City Council. The contract was to replace an aging existing sewer main that was in poor repair, and to take the opportunity to realign a section that was previously running under an existing house to meet Wellington City Council’s policy requirements. This contract was broken into two sections. Access was difficult and all work was within private property on steep sites. 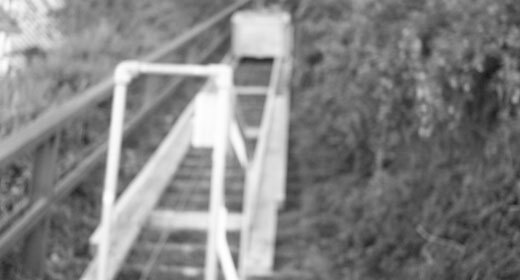 The lower section was accessed from the stairs at number 510 Evans Bay Parade with a rail system being installed on the stairway. This enabled the stairs to be protected, and maintained walking access between the rails at night. A bin on skids was winched up and down the rails to get all plant and materials to site. The drain was laid on a new alignment and this was hand dug through hard rock using breakers for assistance. All manholes were hand dug and constructed with 300mm concrete risers. The upper section was within back properties. After investigation and discussion with the property owners we managed to remove a few fences and make access for a small excavator for the length of the new drain. It was identified during the construction of the access track that a large tree was over the alignment of the new drain so we came up with the idea of pipe ramming a steel casing under the tree on grade. This was completed successfully. Other areas below a retaining wall were also identified as a concern and we implemented pipe ramming again to minimise the risk to the wall. Again this proved to be very successful. Another area that was to be hand excavated was completed using a small excavator by removing the cab to enable the excavator to pass under a cable car. We also utilised the pipe ramming to eliminate the need to break through the cable car’s concrete foundation. The supply and installation of 1050mm diameter manholes. The reconnection of all existing service laterals. Continuous liaison throughout the works with all residents. Hand excavation in rock within number 510 Evans Bay Parade. Winching of all materials and spoil up the stairs at number 510 Evans Bay Parade. Steep slopes with limited access. Working close to structures (buildings / retaining walls). Pipe ramming under a large Pohutukawa tree to preserve its integrity. 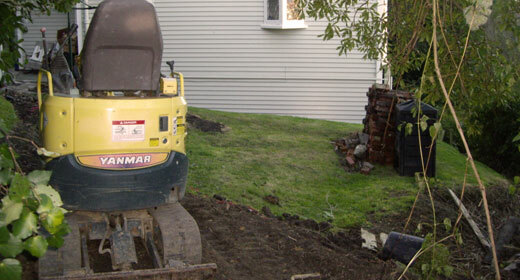 Pipe ramming beside a house and retaining wall to ensure the integrity of both structures. Dealing with existing sewer flows. The work was completed in two sections. The lower section was completed by a team leader and four others. The upper section was completed by another team of five others. Due to the lack of access for the lower section timber rails where laid on the stairs, a winch system was set up and a large plastic fish bin was winched up and down to take materials and remove spoil from the site. On the site induction it was noted that a large Pohutakawa tree was at risk if we were to excavate within the canopy of the tree so it was decided to use a pipe-ram method to lay the new main within this area. 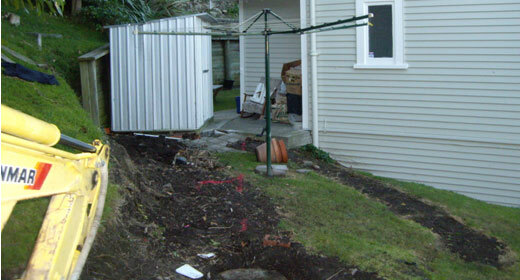 Another area was identified where the new main was to be laid between a house and shed in close proximity to the house foundation and a retaining wall. Again the team decided to use a pipe-ramming methodology for this section. There was also another section under the foundation of an existing cable car where it was decided that, rather than disrupt the foundation, it would be beneficial to pipe-ram under the foundation, therefore ensuring the integrity of the foundation. Yes the contract works were completed on time. Was the Job on Budget? The contract was completed within budget. There were no quality issues or any rework. There were no accidents or near misses recorded during this contract. Continuous onsite training for all staff members. Many team members were working towards completion of their Civil Infrastructure Introductory Skills Certification. Oldfield’s Asphalts Ltd were the only subcontractor used for the contract work and they completed the surface reinstatement of the driveway. There weren’t any issues with Oldfield’s Asphalts Ltd. The weather conditions were generally fine. However there were eight days that were affected by rain causing the site to become slippery and dangerous. The lower section of the contract within number 510 Evans Bay Parade was accessed entirely from the stair access to these properties. A winch system was set up on the stairs to take materials to the site and remove the spoil from the site. The top section was accessed down the driveway of number 93 and 93a Overtoun Terrace. 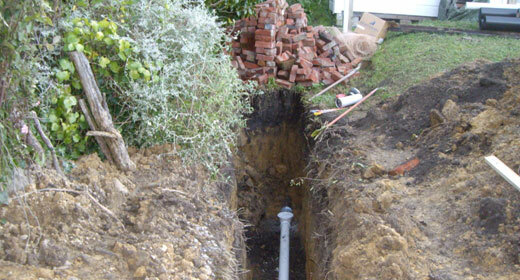 Fences were removed and then access gained through the properties on the alignment of the new sewer main. Ground conditions varied between the two sites from Hard Rock through to soft soils. Both sites were very steep with limited access. 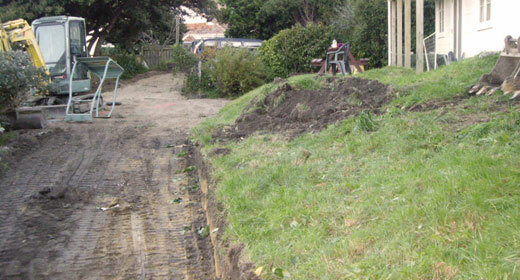 We had trenches over 1.5 metres deep that required shoring. Working around trees and retaining walls. No liquidated damages were enforced. No, the plans weren’t redesigned, however, the methodology was changed to allow the work to be completed while reducing the impact on the properties. The work was completed within budget including all variations, therefore the client got value for money. The work was completed to high standard, meeting all specifications. Once finished, all properties were reinstated, landscaped and carefully returned to better than original condition with extra little things being done to meet the owners’ requirements.